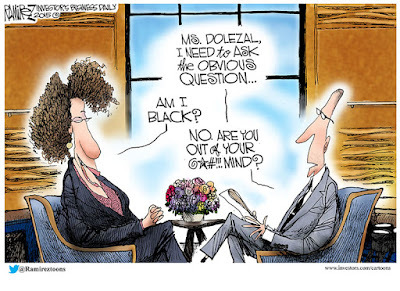 This ENDS this blog's comments on the Dolezal B. S. but some of this stuff has been simply too snarky to pass up. Since a white NAACP lady can be a black lady and a half black man can be voted in as president of the US twice, what is the value of affirmative action? 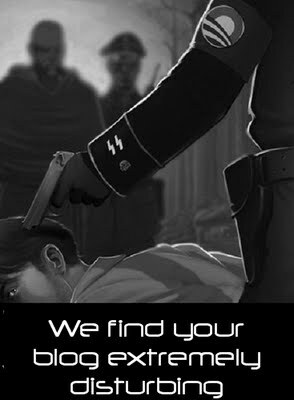 How does one determine race? Maybe we just move on? 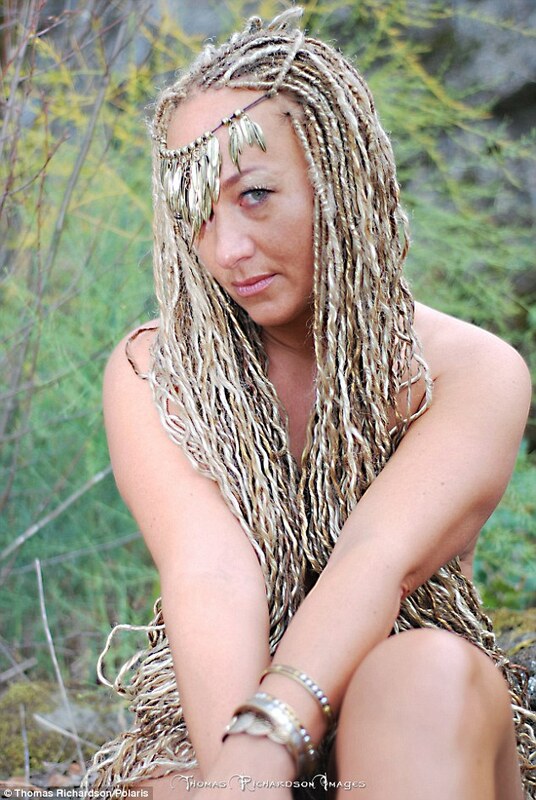 The Daily Mail published the comprehensive and definitive, and one would hope, the last word on Rachael Dolezal and you can read it all here with more salacious photos. One can only wonder whether she is using these glamor shots to attract would be suitors on dating sites. That's too much to process because I can imagine the black-only response of photos with their 'courting tackle'. 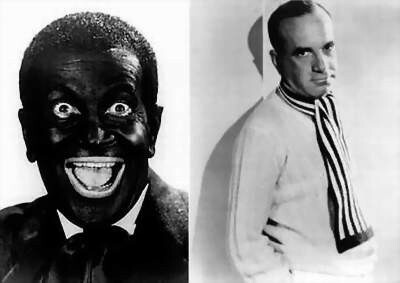 (Daily Mail) Born with freckled ivory skin, Dolezal's black image today is the product of regular spray tans - 'medium' Mystic Spray from Palm Beach Tan in Spokane, Washington, it is claimed. The treatment, which costs $60 a month for unlimited top-ups, ensures a 'long-lasting tan' all over the body. Customers stand naked in a booth before being sprayed from every angle. 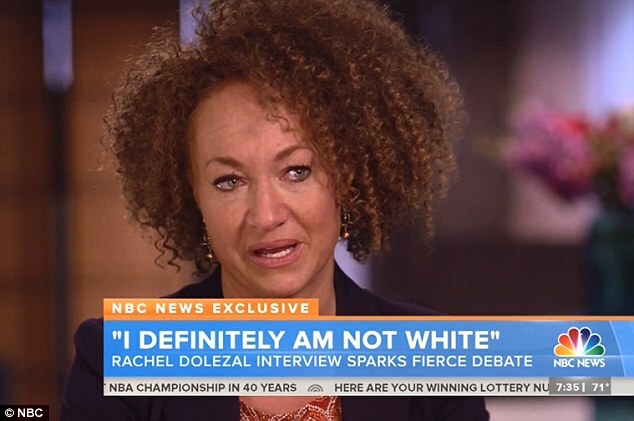 Jenner looks a bit like Dolezal if you discount that Jenner is a 65 year old man and Dolezal is a 37 year old woman. Some men may say, "Take it off". I say, "Put it back on - please". It used to be politically incorrect for a white person to walk around in "black face", but Rachael Dolezal broke through that glass ceiling for the rest of us. 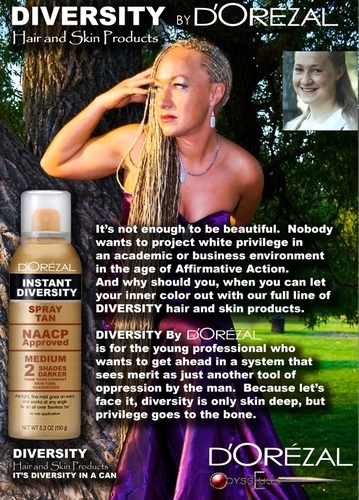 If the power elite aren't taking you seriously and you have grievances, what better way to deal with them than to buying and using the new diversity products advertised below. Who knows, maybe you too can quit your day job and be president of your local chapter of the NAACP? I know that this story has dominated the news and eclipsed the "real news". We'll pay attention to that next week, bringing you up to speed on all of the crap in North Korea and the Middle East that the news ignores anyway. 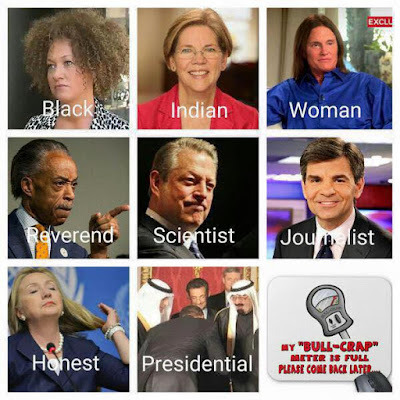 The phrase "fake it 'till you make it" has been given real legs this past month, with Hillary Clinton condemning Wall Street for being rich (unlike poor Hillary - will somebody please send her an actual crust of bread that she can gnaw on); and the NAACP spokesperson (white girl from Montana) who was only a wanna-be African American after all; and Al (Crazed Poodle) Gore, who invented the Internet and Global Weather. It's Halloween every day in the progressive movement. Would I qualify for an ObamaPhone, free cheese and other perks if I simply came out of the closet and say that I'm bi-cultural since my ancestors came from Europe but I live in America now? Or do I also have to affirm allegiance to Obama-Clinton? The Donald threw his cracker into the soup this week and declared that he'd rule this nation through executive action and if Congress didn't like it, he'd brow beat them. Trump raised hackles on Fox News' The Five.